Whenever my mom asks me what kind of cake I want for my birthday I say a cookie cake. 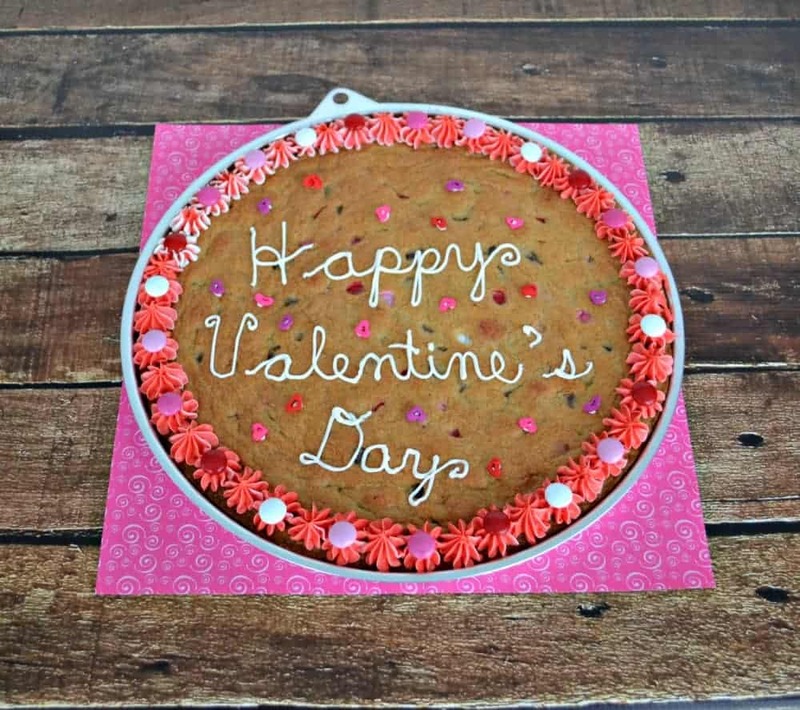 While I like vanilla cake and other flavors of cakes, my real favorite is the giant cookie cake. 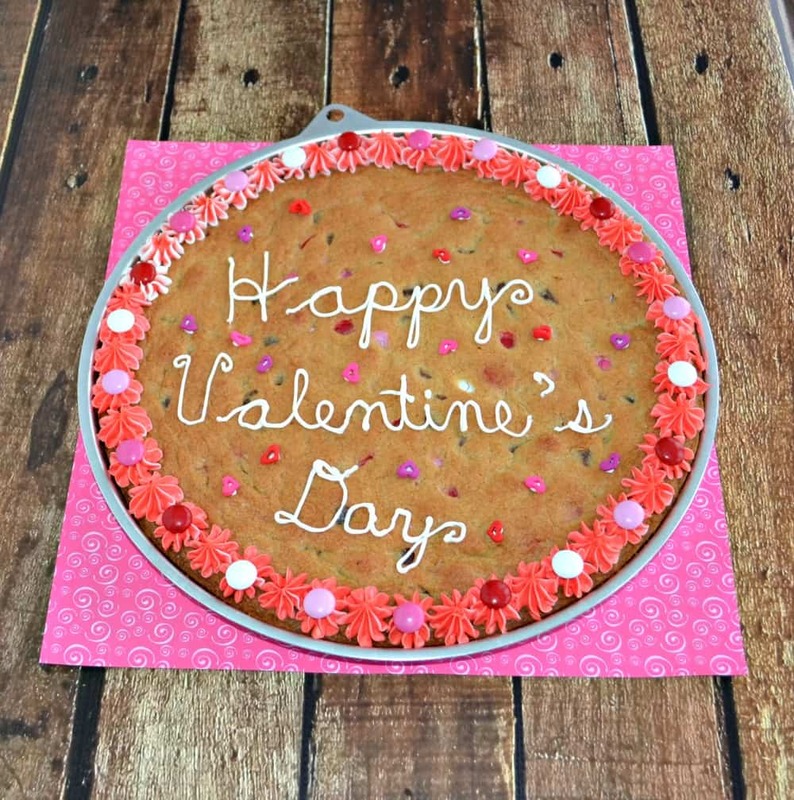 Who wouldn’t love a giant chocolate chip cookie with frosting on top of it? Sometimes my mom bakes it herself and other times she buys it from the local store. So this year for Valentine’s Day I decided we needed a Valentine’s Day cookie cake. I took chocolate chip cookie batter and mixed in some Valentine’s Day M&M’s. I placed it in a large, round baking pan, and cooked it in the oven. When it came out let it cool and then I tinted some frosting. I made a traditional buttercream frosting and tinted it pink, red, and white. I decorated the cookie cake with a pink and white border. I wrote Happy Valentine’s Day on the cake as well. Then I used the leftover Valentine’s Day M&M’s and put them on top of the frosting border in a pattern. I also sprinkled heart sprinkles on top of the cake to finish it. I took this cake into school earlier in the week and the kids went nuts over it! 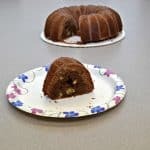 They were thrilled to have a chocolate chip cookie and a cake in the same bite. The kids kept asking me if I made it because it was “so good”. I have to agree as I may have had one (or two) pieces of cookie cake myself. 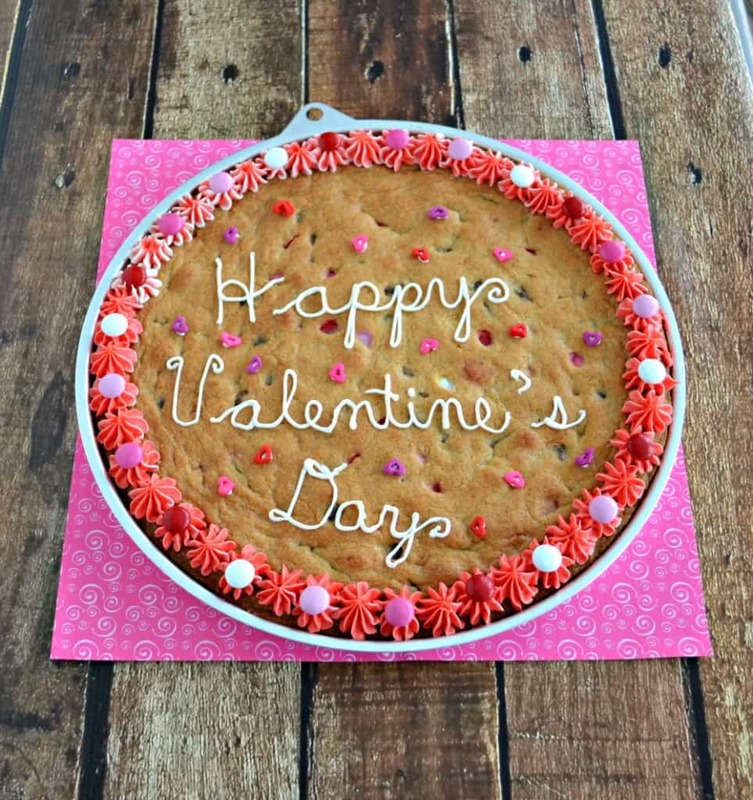 A giant Chocolate Chip Cookie Cake made with Valentine's Day M&M's and decorated with buttercream frosting. In a large bowl combine the flour, baking soda, and salt. Set aside. In a medium bowl cream the butter, sugar, and brown sugar. Stir in the vanilla. Mix in the eggs one at a time. 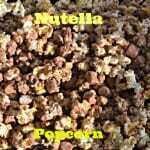 Add the wet ingredients to the dry ingredients and mix until combined. Gently fold in the chocolate chips and Valentine's Day M&M's. 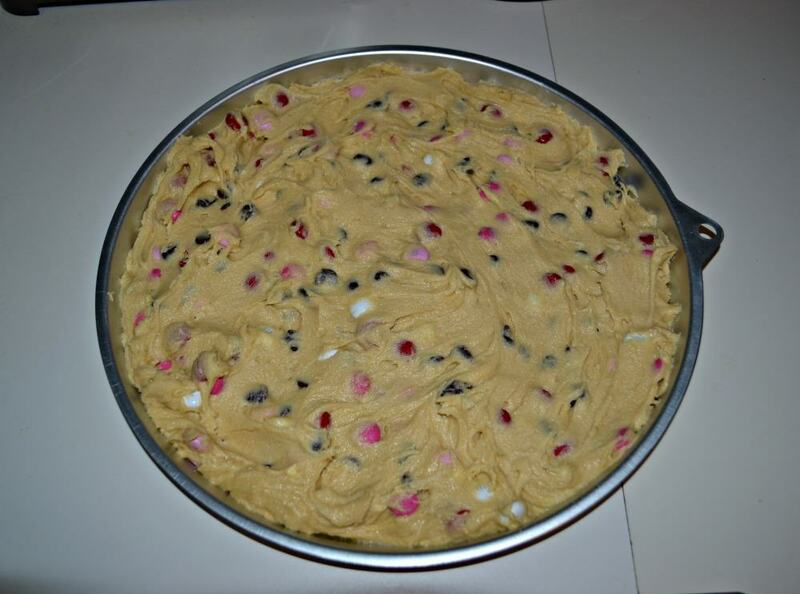 Spread the cookie batter into a greased 12 inch circular baking pan. Bake for 20-25 minutes or until the cookie is golden brown and a toothpick inserted into the center comes out clean. In a medium bowl beat the butter with a mixer until smooth. Add in the vanilla and mix well. Add in the powdered sugar a half cup at a time, mixing in between each addition, until the frosting is thick. Stir in the milk 1 tablespoon at a time until desired consistency is reached. Add food coloring to the frosting and pipe it on the cake. 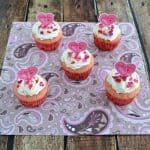 Top with sprinkles or Valentine's Day M&M's. 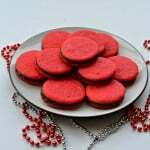 I have never tried cooking , These cookies looks awesome!